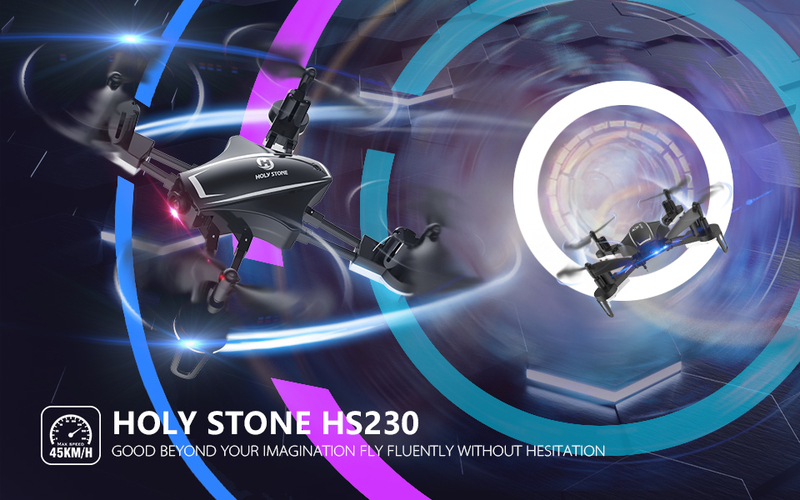 Holy Stone HS230 RC Racing Quadcopter - A Great Racing Drone That Can't Be Missed. 5.8GHz FPV Real Time Transmission and 2.4GHz Operating Frequency--The 5.8GHz Analog Signal Receiver and 2.4GHz Operating Frequency provides more stabilization and zero-latency; enjoy real time video from the longest sight distance. 720P FOV 120° HD Modular Camera for Aerial Photography --LCD Monitor is equipped with Transmitter.No phone required. Modular Extra Batteries-- Design to ensure safety for both usage and charging; 2pcs of high performance batteires double your flight time. Bright LED Lights--LED navigation lights and remote control indicator light for night flight. Low Power Alert-- Enable pilot time to solve any potential problem in time and make sure that the racing drone is always under control.